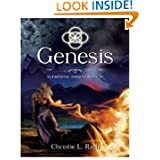 Genesis by Christie Rich is the third novel in this series about an Elemental named Rayla Tate. So far it has been my favorite. In “Five” the first of this series, we are introduced to Rayla, who is an Elemental, or one who can manipulate the elements. She was raised in the dark about Elementals and the fae realm she’d soon get thrown into. We are also introduced to four fae lords, all of who are hoping to win Rayla’s heart and convince her to bond with them. The first novel wasn’t action packed, but I did enjoy a lot of the world building and the beginnings of a romance. It was a fair set up to the next in line “Dark Matter”. In the second novel we learn more about each fae lord as Rayla tries to choose which one to bond with. We also meet a new one here. Action was better in this second novel, as well as the characters behaving in a more believable manner. Editing in the first novel wasn’t the best, a few typos and such tripped me up more than I would have liked. “Dark Matter” had fewer problems and for the most part I enjoyed it. In Genesis we find the characters developed even more. I found myself able to connect with the main character in a way that I had not in the first two. The tension is held well from start to finish and the action is better in my opinion. There weren’t as many slow spots that tended to make the text drag. It should be enough for those who want more than straight romance in their stories, though things are definitely still hot between Rayla and the lords here. The romance part has been a high positive for me in all three novels and is what first caught and held my attention in “Five” and “Dark Matter”. I personally don’t mind a small lag in action if it helps to build up the romance part of things. I believe there is a balance in this third novel that wasn’t in the first two. If I had to pick a downside to this series, and especially in book three, it is Rayla’s constant questioning of the lord she finally ends up choosing. (You’ll have to read for yourself to learn which one.) I actually found myself getting irritated with her a few times. I didn’t mind problems cropping up to keep the two apart, but I didn’t like her constant questioning of his motives. I wanted her to grow up, take charge of her life, and stop acting so confused. But, all in all, this was a minor point and not enough to make me stop reading. I would like to give Genesis 4.5 stars but half stars aren’t available. I think Christie Rich is getting better with each novel and I’m definitely looking forward to book four. Posted by Denna Holm on August 31, 2012 in Archives and tagged fae lords, fantasy, fantasy romance, gods, paranormal, paranormal romance, sexual tension.